Recently I was contact by a young gal named Lilly from the States who wanted to interview about my interest in patch collecting for a school paper she was writing. I was deeply touched that wanted to do so and instantly agreed to conduct an interview by email. Once it was completed, I asked her if she'd be ok me publishing her questions along with my answers to them here on this site and she said that was totally fine that. Though I've been interviewed before by various blogs, publications and radio stations in relation to certain interests and aspects of my life, this was the first interview I'd had pertaining to patch collecting, which makes extra special in my eyes. Long time readers of this blog may already know some of this information about me and my history with patch collecting, but as I haven't done a post on the specifics of what got me into swapping and gathering Girl Guide and Girl Scout patches in quite a while, I thought that this interview would make for a great post on that topic. Without further ado, here's the lovely interview that Lilly and I held last week. 1. What was the first girl guide item you collected? Technically the first Girl Guide item I collected with a Girl Guides of Canada Brownie program book and small number of Brownie badges that had belonged to one of my aunts in the 1960s. My Grandma gave me these items to play with for fun when I was little, however I did not become a member of the Girl Guides of Canada myself until a few years later when I was 12 years old. Once I was part of the GGC myself, I began to ardently trade and collect Girl Guide patches at camps and other Guiding events (in my home province of British Columbia) and have been hooked on collecting GG items ever since! 2. Why did you decide to collect girl guide insignia? I've always enjoyed collecting a wide array of items (I have pretty eclectic tastes), but for me as an adult now these days, collecting Girl Guide items is a way to keep the wonderful memories I have of my years as a youth member of the GGC alive and in my heart. I've been chronically ill for the past decade and not well enough to be an active member of the GGC, so for me collecting is also an especially important way to not lose the connection I loved so much when I was younger with Guiding. 3. What is your favorite item in your collection? 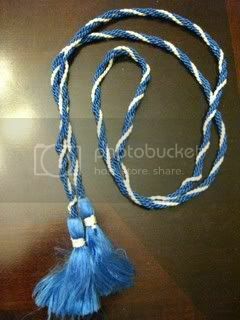 This is a very tricky question to answer, because I have so many favourites, but I would have to say that my favourite item is the red and white, tasselled Canada Cord which I earned myself when I was a Pathfinder. 4.) How or where do you get your pins/badges/patches from? When I was a youth member of the GGC I collected all of my patches and pins with other girls or adult members at camps and other Guiding events, however since I began collecting again a few years ago (in 2007), I've connected almost solely with fellow collectors online and arranged trades by email (with the items themselves going out and arriving by postal mail). Through online trading I've connected with people as close as my own city and as far away as places like Australia and South Africa - some of whom have since become good friends (as tends to happen when Girl Guides and Girl Scouts connect anywhere!). 5. Was there anyone who inspired you to start collecting Girl Guide insignia? No, not specially. I started collecting out of my own interest in Guiding as a girl and collected the whole time I was with the GGC. In 2007, wanting to reconnect with my Guiding roots, but not being in good enough health to be an active member of the GGC, I started collecting again and have been doing so ever since (and certainly plan to collect for as long as I possibly can). 6. How long have you had your collection? Unfortunately only a few (perhaps six or seven) items from my childhood collection survive any more (nearly all of my first Girl Guide collection was lost during a move many years ago), however I've built up a wonderful collection over the past four years, which is the duration for which I've been collecting again for as a adult. 7. 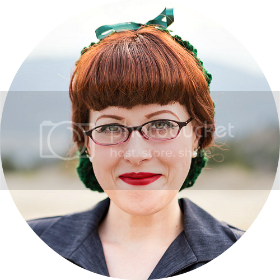 Why did you start your blog for girl guides and girl scout? 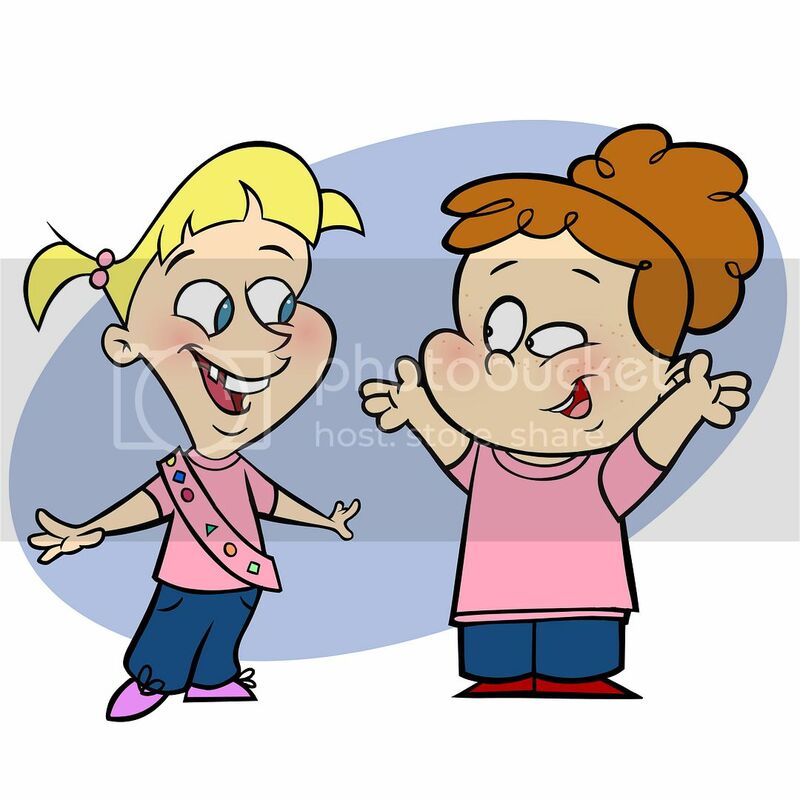 I started my Girl Guide and Girl Scout blog primarily for two main reasons. One, to share my love of Guiding and patch collecting with the world, and secondly as a means by which to connect with fellow patch collectors online. I want to sincerely thank Lilly for finding me, this blog, and my patch collect interesting enough to interview. Doing so was a total joy and I very much hope that my answers helped her get a great grade on her school assignment. My goodness, can we really be nearly half way through the sixth month of the year?! I realize that there haven’t been too many new posts so far throughout 2011 on this site, my friends, but serious ongoing health problems have been occupying much of my time. As always, you can send patch trading offers my way, just be aware that it may be a smidge before you hear back from me. Whatever you’ve got planned for the coming summer (or winter, for those south of the equator) months – from starry nights spent in a sleeping bag under the stars to mountain hikes, international Guiding trips to some good old fashioned patch trading around a campfire, I wish you all an absolutely fantastic summer!!! Have you seen Lee Ann's awesome Girl Guide patch collection? No? Neither had I until a Google search last night (for "Northwest Territories Guide patches", a term I periodically hunt for in the hope that someone out there on the good ol' interwebs will be looking to swap some of their NTW or Yukon patches) led me to discover the delightful homepage of a fellow collector named Lee Ann, whose put up images of some of here wonderful Girl Guide patch collection on her site. Sadly over the last few years, many folks who once kept similar sites bursting with photos and/or scans of their great collection of Girl Guide and Girl Scout patches have closed down, which makes it all the more awesome that people like Lee Ann (whose patch collection - which includes very recent items, including some GGC centenary patches - attests to the fact that this site is currently wonderfully up-to-date) decide to share their treasured collections with the world. Though I couldn't find an email address on Lee Ann's site (so as to contact her to discuss doing a patch swap), she does have guest book on her site, which you can contact her through (or simply leave a friendly message from a fellow patch collector, if you prefer). 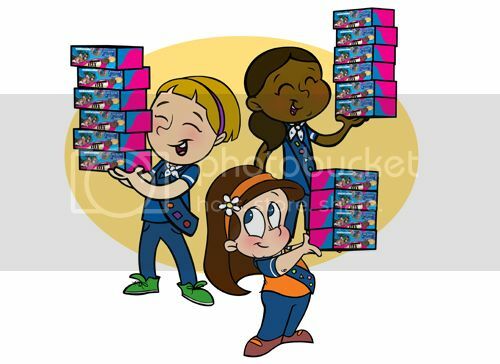 Are you looking for Girl Guide cookies? 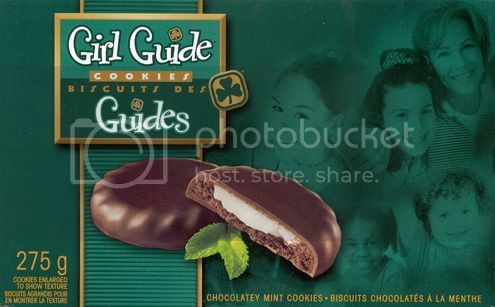 Like many of us, I have scores of memories pertaining to Girl Guide cookies. I happily trooped around my neighbourhood as a youngster (often with my elementary school best friend and fellow Girl Guide, Karen, and my little sister in tow) selling box after box, case after case of Classic Vanilla and Chocolate cookies, as well as those wonderfully scrumptious Thin Mint cookies (which were often easier, I found, to sell in multiples). 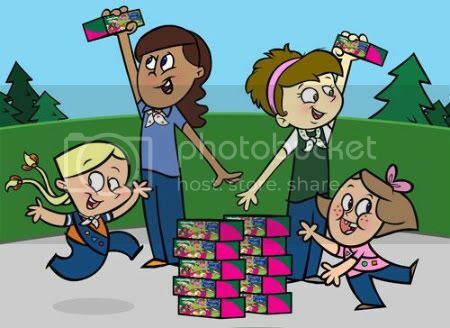 Girl Guide cookies are delightfully fun to eat, while also being highly important to the GGC (the funds they generate go a very long way in helping the organization). However, sometimes they can be tricky to track down (even during cookie campaign time), especially if you don't live in the immediate vicinity of a Guiding unit. For example, I've lived at the same address for the better part of three years and never in all that time, have I had a single Spark, Brownie, Guide, Pathfinder, or Ranger come merrily knocking on my door with their case of cookies. Yet, what some folks may not know is that many Guide units (and/or District offices) often have a supply of cookies available for part or all of the year (or know another unit that still has some in stock). If you're not a member (or have a child who is) of the GGC though, it can sometimes be tough to find unit in the phone book or by word of mouth. 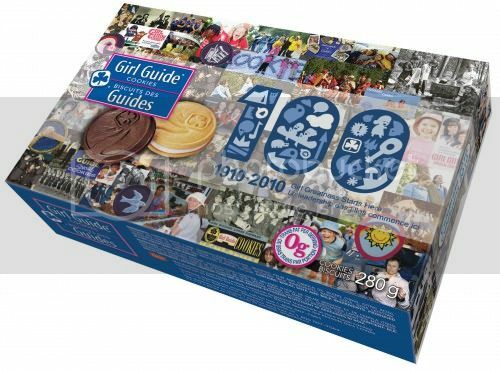 Happily for all those who are looking for Guide cookies, there's a great form on the Girl Guides of Newfoundland and Labrador's website that you can fill out and then be put in touch with the nearest GGC unit in your area. So the next time a craving for a wonderfully crisp vanilla sandwich cookie or delectably sweet Thin Mint biscuit strikes you in between cookie campaigns, you can get in contact with the just the right person to help satisfy your need, while your purchase helps the GGC at the same time (definitely a great - and very yummy - win-win situation all around!). You may have heard me comment on before that it seems as though with each passing day (or least month) there are fewer and fewer of us actively trading and collecting patches online any more. Whereas once this hobby was alive and buzzing across the net, these days it seems that more many more sites devoted to patch collecting come down than go up. 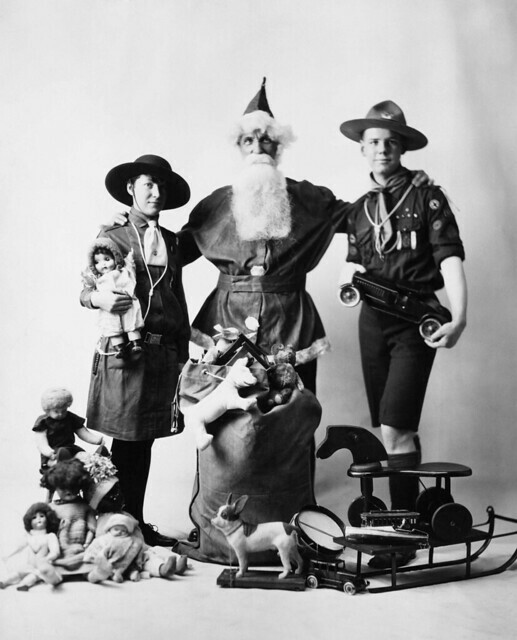 As such, I feel that when I get wind of a new site or blog devoted in some capacity to Girl Guide and/or Girl Scout patch trading and collecting, it's all I can do not to jump for joy! I love knowing that people are still taking up (or renewing an interest in) this rewarding, fun-filled hobby, and believe that those of us in the GG/GS patch trading community should do our best to help support these fledgling collectors. A few days ago I received a lovely email from a woman named Ashley "Stormy" Martin in which she informed me of her brand new site, called "Stormy's WAGGGS Patch Trading Blog", that's devoted to her interest in GSUSA patch collecting. I'm sure many of can remember when we first started building up our collections and how fantastic it felt when veteran traders were able to help us out by swapping patches and sharing their years of knowledge with us. I will always be indebted to a few kind souls who assisted me in this way (especially my good friend Louise St. Germain). I definitely remember how I felt when I started collecting patches online, openly encourage any and all fellow patch collectors who are reading this post to bop on over to Stormy's great new blog to say "hello" and see if there's something on her dupes list (which includes some of the beautiful new GSUSA 100th anniversary items) that you'd like to trade for. If this terrific hobby of ours is going to continue to thieve as we head into the second decade of the twenty-first century, we really need to foster and support new patch traders as much as possible, and I for one am absolutely thrilled to see sites like Stormy's blog emerging again.